Designed to easily attach to your existing roof pole system the Monsoon roof pole offers more support for your awning roof in heavy rain, making it another excellent product from Kampa for giving you peace of mind in the worst of weather conditions. Each model of Rally needs a different number of Monsoon poles. The list below shows the number you will need for your awning. Please adjust the quantity you need to purchase in your basket. 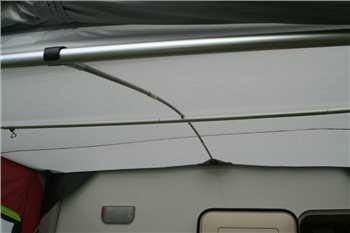 Having just splashed out and bought a new more expensive awning to replace the older one that was showing signs of wear and being fed up with having to keep an eye out day or night in wet weather to push the rain water that collected on the roof to avoid the awning collapsing, I was really surprised when our brand new one did the same! So having Googled the problem and read about Monsoon Poles decide to see if they did what everyone said they did. Brilliant! Not only in the rain but also the very windy weather too for stability. As we go away most weekends during the summer we tend to use our awning more than the average caravanner. This should not be an optional extra I would say this is definitely an essential item, the awning is not complete and does not function properly without them. I used these poles on a similar awning with another brand than Kampa last weekend (easter). Worked perfect in all kinds of weather, snow and rain. No pools on the roof and they even helped to stabilise the awning in the blowy wind. These "Monsoon Poles" are not possible to buy here in Sweden. Dont order from the internet, said my friend,you dont know what you will end up with.Well i did order and recived exactly and quickly what i wanted also saved a few pounds on the price. Thank you Camping World you made my day. We have ordered 3 poles but one of them was the wrong item. Customservice got one from an other shop and sent it to us free of charge. Very good service and very functional item. In easter we tried the tent and the poles. Easy to use an very stable. As a Caravan Club warden I use my van a lot. I just bought a new Kampa Rally which came inclusive with monsoon poles. This week high winds and very heavy rain/hail gave it a good test. It stood up to the lot with no puddles on the roof!